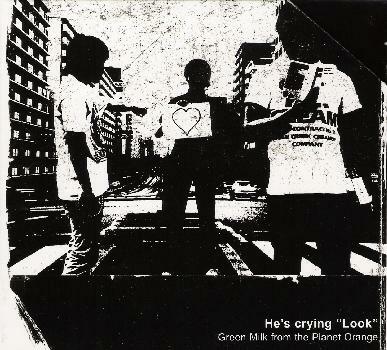 Green Milk From The Planet Orange - "He's Crying Look"
Emerging from the currently flourishing Japanese psych rock scene, Green Milk From the Planet Orange blends psychedelia, space rock, metal, experimental jazz, and electronics into a unique and refreshing sound. Taking what have become psychedelic conventions, the band twists them around in space and time, taking them into innovative, weird and wild directions. Take for example, the album opener, When Every Colour Turns Black. The classic psychedelic Eastern guitar riffing of the first 6-minutes gets an exotic jazz twist with congas and trumpet buoying it along, before the piece erupts into a furious rocker with lots of melting, acid guitar work. The lengthy U-Boat is a true stunner. It begins with soft waves and radar pinging, and you might think this is going to turn into a spacey Pink Floyd like excursion until a voice suddenly screams out, cutting through the tranquility, and the band launches into a scorching psychedelic jam with pulsing bass, lots of furious drum work and searing machine-gun fire guitar riffs. The piece even drops off in the middle to include a very imaginative ambient section with bubbling, spacey, analog synthesizer, soft radar pings echoing in the distance, liquid guitar textures floating in the background and distorted voices drifting in and out of the mix. As it's name suggests, the 22-minute In the Space, Far Away From This Planet is a truly cosmic space journey. A slowly building haze of analog synth, distant cymbals, and echoing guitar effects climaxes in a chaotic freak-out, before breaking into a slow paced jam with fluid guitar and weird, beautiful and eccentric vocal harmonies that recall Gong and in parts, even the retro sing-song vocals of Stereolab (though musically, the effect is quite different). It's a beautiful and soaring end to the album. This is the kind of music that really takes you on a journey, one of the hallmarks, in my mind, of the best psychedelic music. There are two shorter pieces on the album as well, Sweet 5 am, a crunchy, moody, languidly paced rocker, and Butterfly, which is a surprisingly mellow and melodic piece that, despite the punchy rhythm guitar, has more of a jazzy ballad feel to it, but with spacey electronic effects keeping it tentatively in outer space. You can hear Green Milk From the Planet Orange's influences in their sound, but that's about as far as it goes. These guys put new twists into their stuff, playing some of the most exciting and original sounding psychedelic music that I've heard in a long time. Highly recommended!